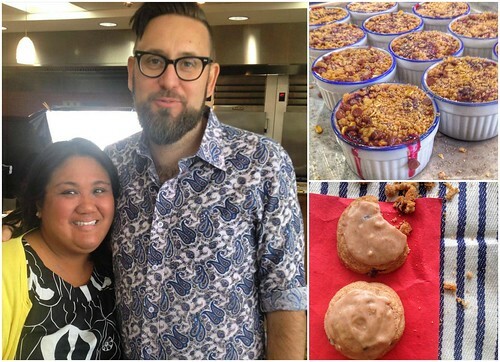 Recap: Krusteaz Baker's Dozen at IFBC 2015! Life has been quite hectic over here the past week or so. With long hours working at the pharmacy, recently hosting a successful Filipino pop up dinner, Joel getting pneumonia shortly after and caring for my mom who has had multiple doctor visits, I needed some space. I needed to get away. And I am so thankful I had a chance to head to Seattle. 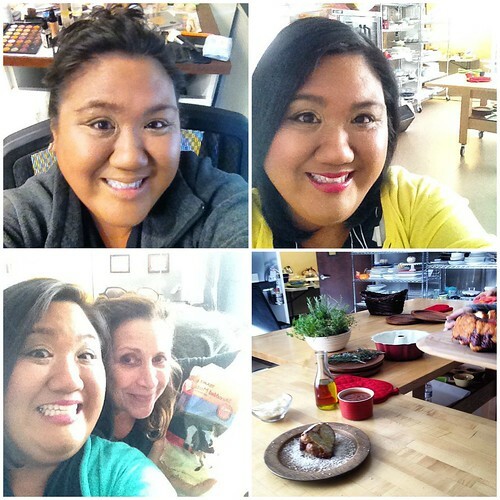 I couldn't back out of my trip since I was on my way west to work with Krusteaz and to also attend the International Food Bloggers Conference (IFBC). It was a much needed, fun and fantastic long weekend to reconnect, re-energize and release myself from daily "life." It wasn't all fun though. In fact, I had maybe 3 hours of sleep before flying out. With so much going on at home, my only opportunity to pack was the night before and of course, I had mountains of laundry to do. So, I stayed up until the wee hours of the morning only to realize my taxi was picking me up in 3 hours. Do I sleep or ride it out? I ended up sleeping... barely. Just when I was about to doze off, Patrick woke me up so we could head on out. Gah! Our flight was about 4 hours and I'm thankful I got some sleep on the plane. By the time we landed, a driver whisked me away to Krusteaz headquarters so I could start getting ready for some videos to film. Thank goodness the makeup artist was able to use her magic and disguise the tired look I came in with lol. We ended up filming 2 segments in roughly 2 hours, featuring some kitchen tips and tricks to make cooking/baking not only easier but fun! After filming, we headed to the hotel to meet with my fellow 2015 Krusteaz Bakers Dozen ambassadors for dinner at Seattle's popular Purple Café & Wine Bar. 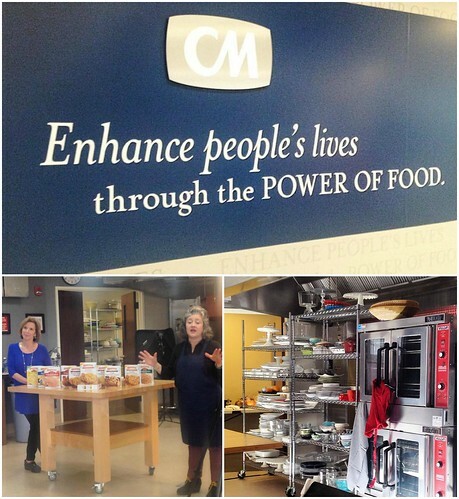 That's when I got to see my dear friend, Susan of Doughmesstic. 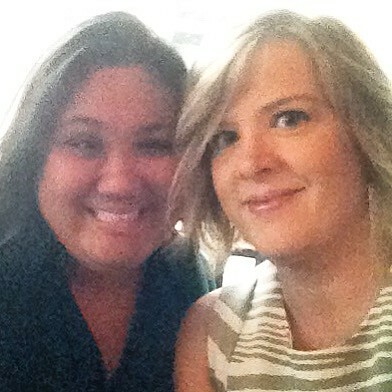 We often keep in touch online so it was good to see her in person and catch up! The next day, it was back at Krusteaz headquarters to work more with their product line. 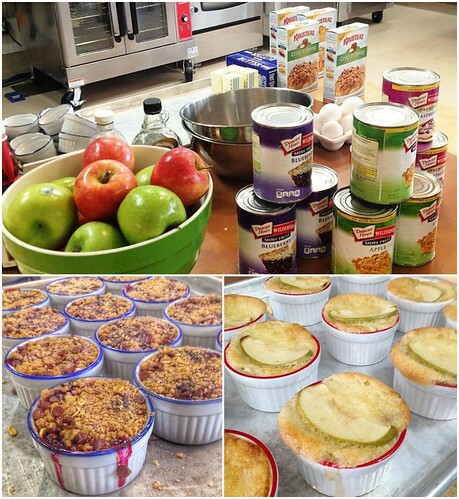 One of our projects was to make lunch using a variety of Krusteaz mixes. We were split into 4 groups - appetizer, salad, entree and desserts. Each group was to use available ingredients and incorporate Krusteaz products into their dishes. 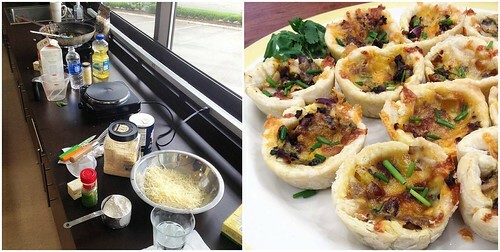 The appetizer group prepared these Cheese & Roasted Vegetable Tarts. They were delicious and incorporated Krusteaz Pie Crust Mix. 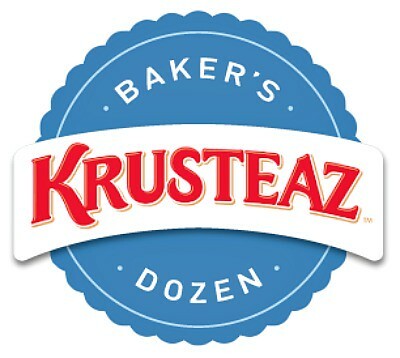 Did you know the Krusteaz company was actually started as a result of their pie crust mix? A group of women came up with "Krust - Eaz" for a pie crust mix in which you only needed to add water! As a result of this appetizer, I have a new found love for the mix and want to play around with it to create more recipes! 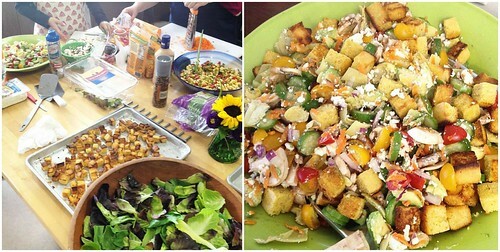 The salad group prepared 3 salads - leaf greens salad, chopped garden salad and a southwest corn salad. I especially loved their chopped green salad and southwest corn salad. But we all know what the best part of salad is, right? The croutons! They prepared some Krusteaz Cornbread Mix, cut them into cubes and toasted them to add in. Additionally, they made another batch of cornbread to serve with the salad and added some chipotle peppers for a little spicy kick. 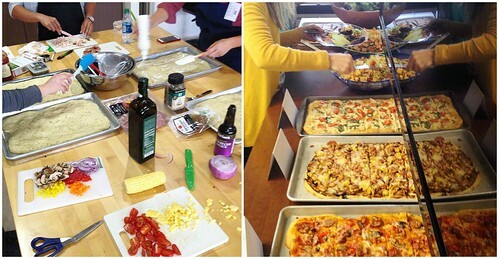 The main entree group prepared 4 types of flatbread pizzas. It was a perfect choice to go with the salads prepared. Using Krusteaz Flatbread Mixes, the group came up with four kinds of flatbread - chicken alfredo with spinach and tomatoes, Hawaiian, Meat Lovers and Roasted Veggie. They were all so good and my fave? The chicken alfredo with spinach and tomato! Lastly, the dessert group that I was in had a lot of fun preparing a couple desserts. We made two sweets - triple berry chocolate chip crisp and a maple apple cobbler. I'll be posting the recipes soon! I will say that when you have a group of food bloggers in the kitchen, you can be sure whatever they make will be delicious. All our dishes really complimented each other and I was so proud and impressed at our efforts! It makes me want to have them all come over and cook/bake meals together lol. Just as our food coma started to set, it was time for our next project - photography tips and tricks. Todd Coleman headed up our photography session and he pretty much blew our minds with his vast knowledge and information shared. I learned so much that I'm finally going to set up one of our bedrooms as a photo studio so I can work on my food photography. Meeting him and learning from him was the push I needed to take a closer look and put more effort into my food photos! 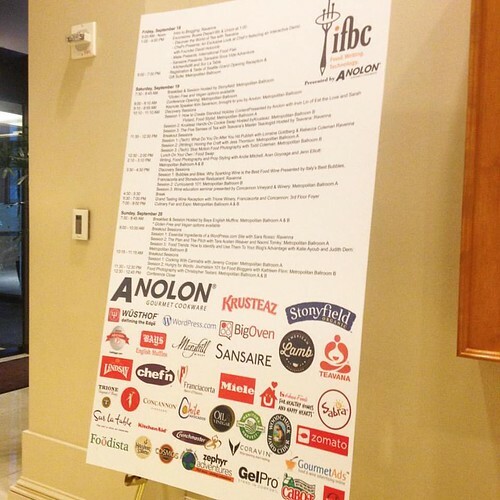 After our photography session, it was time to end the day and prepare for the IFBC conference. 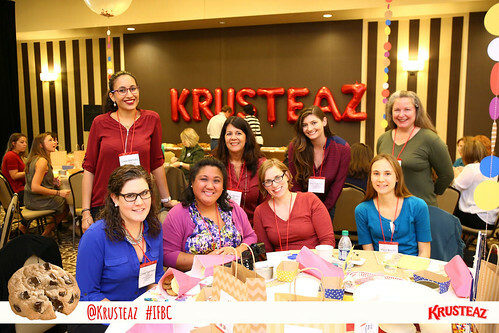 With Krusteaz as one of the main sponsors, theKrusteaz Bakers Dozen helped facilitate a session held for attendees. 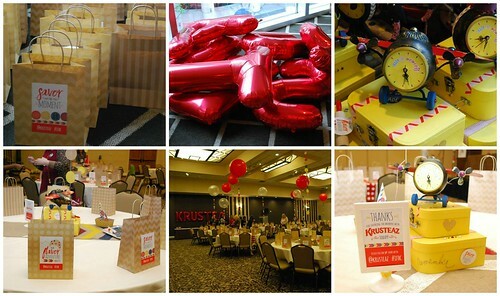 We also helped Jenn Sbranti of Hostess with the Mostess set up the session with all the cute items she created for the event. The theme tied in travel, treats and special moments with primary colors, a touch of gold and natural textures. The session was completely hands on, where attendees created three types of cookie containers for gift giving. 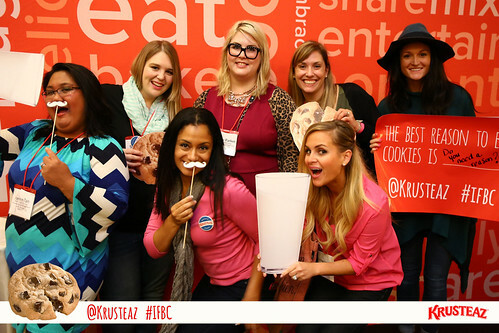 Naturally, Krusteaz Cookie Mixes were the star and everyone got to take some, package them up and share them with others at the conference. Here's my table of attendees I facilitated which included ladies representing Coravin, BigOven, Geeky Hostess, Tangled Up in Food, and Portlandivore. 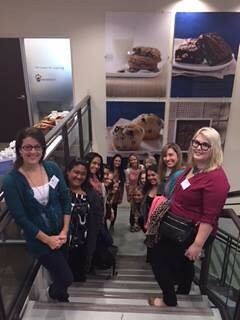 It was a great mix of women of various food perspectives and backgrounds, which made networking while making our cookie containers so much fun. Overall, it was an awesome time and I am so thankful for the opportunity to have experienced the jam packed weekend! Now with it officially the first day of fall, I'm even more excited about getting in the kitchen, creating some delicious eats and savoring the moments. Hopefully you are too! Yum! Everything looks so wonderful! 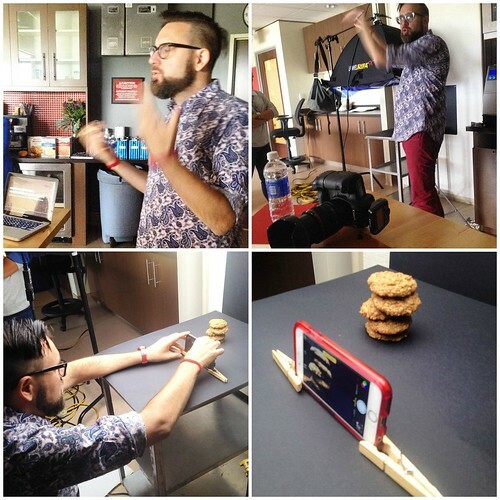 And I LOVE the idea of standing up a phone for shots with two clothes pins. I may be stealing that idea!